World Diabetes day is observed on November 14th. The Diabetic Food Trail, conceptualised by Semora Entertainment and with the support of Britannia NutriChoice, Biocon and Zomato, has over 100 restaurants in the 4 metros across India taking part in this initiative. 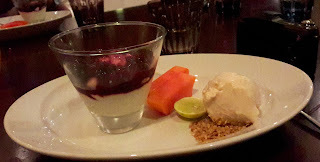 At Chennai, a group of us headed across to Park Hyatt Chennai's Flying Elephant restaurant to sample a diabetic friendly menu. With inputs from wellness expert Dr. Waseem, Chefs Greg and Vamsi have translated the concept into a menu that spans various cuisines and meets the dietary requirements of diabetics, pre-diabetics or those who just want to indulge (!!) in a healthy meal. We were not disappointed. Our menu had plenty of choices, the meal was high on flavor and what’s more, had the calorie count listed beside each item on the menu. So what’s a healthy meal for a diabetic? A plate of food that includes plenty of fibre, is low in carbohydrates, low in calories and has a low glycemic index. And of course, it has to be mostly sugar free. We started with a thin crust whole wheat pizza with the usual tomato and cheese topping and then it got interesting with ricotta, lots of aragula, superthin apple slices and a dusting of sumac resulting in a pizza full of flavor and crunch. The vegetarians in our group opted for the Turkish lentil and bulgar soup, spiced with dried mint and coriander. For the rest of us, it was a wantan soup. A flavoursome yet light broth with chicken wanton and pak choy, it was seasoned perfectly and the hint of sesame oil added to the warmth of the dish. The salad had aragula, quinoa, pomegranate, orange segments and thinly sliced zucchini. 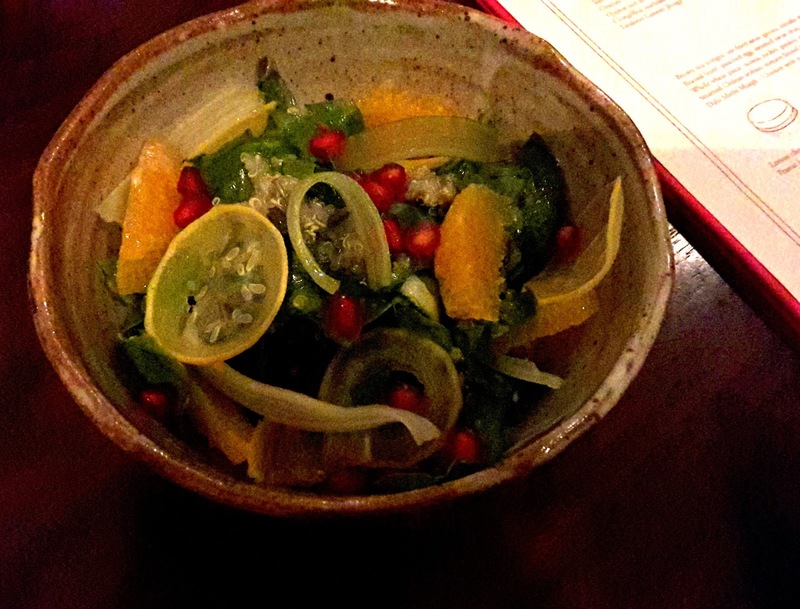 The passion-fruit dressing was light and tangy, the pepperiness of the aragula toned down by the sweet orange segments. At 194 calories, prawns are allowed on a diabetic plate, the key is moderation. 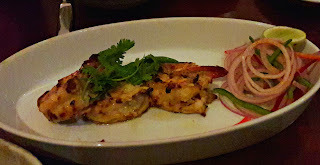 So we had juicy lasooni jhinga – smoky garlic flavoured prawns cooked in a tandoor. 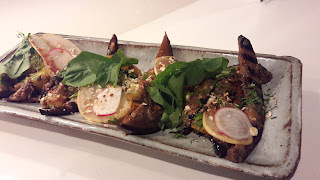 A second starter was chargrilled eggplant with pear and radish slices for crunch. An interesting miso dressing and toasted oat crumbs added the finishing touches. 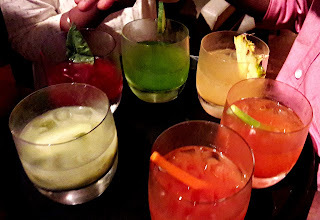 By then a trayfull of mocktails came around. We had a sip of everything but the one I liked the most was Flue, a mix of juiced carrots, spinach, orange, celery and beetroot. Only 110 calories!! The brown rice congee was delicious with the earthiness of shiitake mushrooms, pak choy and bits of gingery warmth. For me, congee is comfort food and this one definitely pleased. 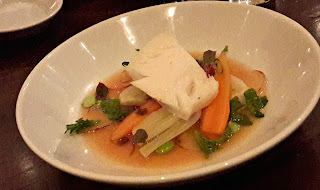 Another stand out main was the steamed Chilean sea bass in a clear tomato fennel broth. Perfectly cooked white fish with clean flavours served with edamame, carrots and cress. The dish and the presentation was a visual delight. There was also dahi methi murgh - chicken with yoghurt and fenugreek and served with steamed brown rice. A trio of desserts was served and that included slices of papaya, a peanut butter yoghurt cup with oat and granola crumb and a lemon cheesecake mousse topped with a mixed berry compote. Very nice. The Diabetic Food Trail will be on till November 30th at Park Hyatt Chennai. Do call 044 7177 1234 for reservations.